What Day Of The Week Is August 30? 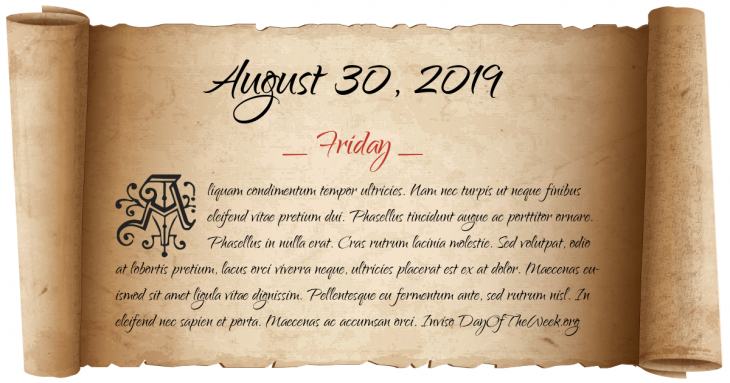 August 30, 2019 is the 242nd day of the year 2019 in the Gregorian calendar. There are 123 days remaining until the end of the year. The day of the week is Friday. Gabriel Prosser postpones a planned slave rebellion in Richmond, Virginia, but is arrested before he can make it happen. Battle of Kulm: French forces are defeated by an Austrian-Prussian-Russian alliance. American Civil War – Battle of Richmond: Confederates under Edmund Kirby Smith rout Union forces under General Horatio Wright. The Second Vienna Award re-assigns the territory of Northern Transylvania from Romania to Hungary. The Lake Pontchartrain Causeway opens. A powerful bomb explodes at the Mitsubishi Heavy Industries headquarters in Marunouchi, Tokyo, Japan. 8 are killed, 378 are injured. Eight left-wing activists are arrested on May 19, 1975 by Japanese authorities. Who were born on August 30?